Lift tables are used to hold, raise, or lower goods or materials. They are normally used to raise large, heavy materials relatively small distances. There are many different types of lift tables, but the two main ways that they are raised and lowered are by pneumatic and hydraulic systems. Lift tables are very valuable not only in the handling of materials but in the prevention and reduction of injuries to employees. Ergonomic lift tables achieve this by using the weight of the load to keep the table at the same level for the worker. For instance, if a worker is unloading a pallet of boxes by hand onto an ergonomic work table, the table will gradually lower as more boxes are put on. This prevents the worker from having to reach higher (and potentially injure themselves) as the boxes are stacked up on the table. Common applications for lift tables include pallet handling (loading and unloading) and work positioning. The S. W. Betz Company sells a number of different lift tables that have various dimensions and capacities to meet your needs. Below are some of the different types of lift tables that we have dealt with in the past. Compact Scissor Lift – Feature a smaller footprint than standard scissor lifts while still maintaining a substantial lifting capacity. Portable Manual Scissor Lifts/Portable Electric Scissor Lifts – Lift tables with wheels that can be transported to and from work stations where they have all the same capabilities as standard lift tables. Floor Level Loader (Floor Level Lift) – Can be loaded with a standard pallet truck and lifted; The unit itself can also easily be transported with any type of pallet jack. Lift and Tilt Table – Gives the operator the ability to control not only the height of the load, but the angle as well. 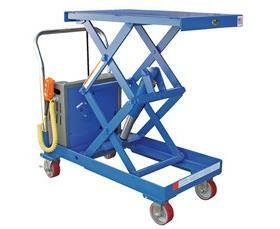 Double Scissor Lift Table – Used when needing a higher lifting height in a small footprint. Ergonomic Pallet Positioners – Key piece of equipment in the prevention and reduction of employee injuries, especially back injuries. The S. W. Betz Company represents many of the top manufacturers in the lift table industry, including Presto Lifts, Vestil and Bishamon. If you are in need of or would like more information on any of our lift tables, please contact us and one of our team members will be happy to assist you. For more information about Lift Tables or any other product or service from S.W. Betz, fill out and submit the form to the right.